Beach Town Blonde | Eek! Where did 2010 go? Gotta get those holiday cards out PRONTO! Did this year go by much faster than usual? It’s already November which means Thanksgiving decorations will soon be replaced by an overwhelming amount of tree lights, shiny ornaments, candy canes, and bratty kids screaming “I WANT TICKLE ME ELMO” or whatever this year’s most sought after toy is. So before things get too hectic and insanely difficult to manage, now is the time to order holiday cards to send to loved ones. In my cards, there will be no cute-as-a-button children smiling with their golden retriever. They charge to much to rent and no one would believe they were mine anyways. In my Christmas cards, it’ll just be The Boyfriend, The Cat, and Me. Probably with WORLD SERIES CHAMPS (GO Giants!!) attire on. 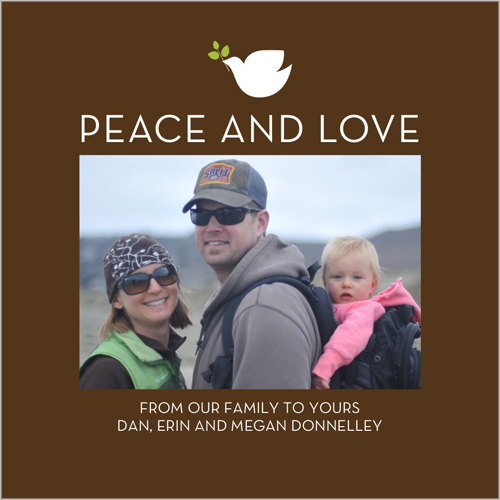 The photo Christmas cards I think would look best with two San Francisco Giants fans and a fluff ball on it is the Peace and Love card pictured below. My two runner up cards were Elegance In Damask Holiday Card and the Sweet Chocolate Christmas Card. I didn’t get cards out last year and thought I’d be too busy to get to it this year but it’s a nice gesture to keep extended family updated that you’re still alive and well, even if you don’t get a chance to say hello as often as you’d like.